Heat oven to 425°F. Bake pizza snacks as directed on bags; set aside. Reduce oven temperature to 350°F. Spray 12-cup fluted tube cake pan with cooking spray. Place 20 baked pizza snacks in pan; sprinkle with 1 cup of the mozzarella cheese; repeat 3 times, ending with last cup of mozzarella cheese. Bake about 15 minutes or until cheese is melted and starting to brown around edge. Cool 10 minutes. Use metal spatula to loosen edges, and place heatproof plate upside down over pan; turn plate and pan over. Tap bottom of pan, and remove. In microwavable bowl, cover and microwave pizza sauce on High 20 to 30 seconds or until warm. Top cake with pizza sauce to look like frosting; top with Parmesan cheese and basil. Cut with serrated knife; serve warm. Be sure to generously spray the inside of the pan with cooking spray to avoid any sticking issues. For a fun presentation, spoon warm pizza sauce into quart-size resealable food-storage plastic bag, and snip one corner. 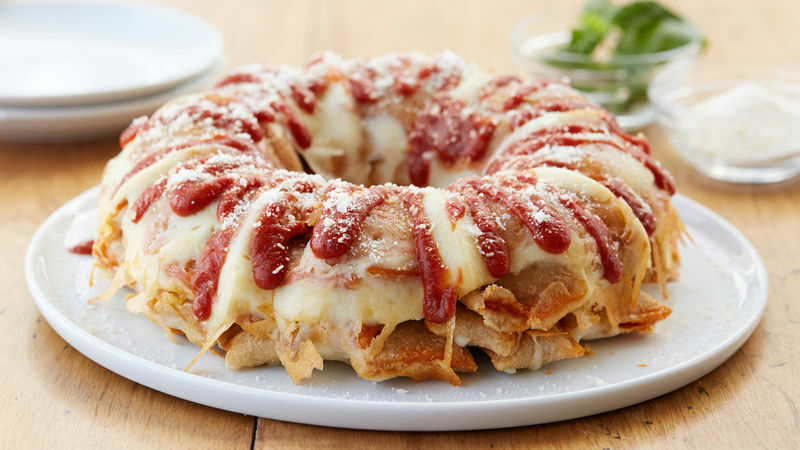 Pipe sauce onto top of pizza roll cake to decorate as you wish. Add a sprinkling of Parmesan cheese and sprig or two of fresh basil.